Offering you a complete choice of products which include air blow guns, lag-a lever air blow guns, lag-c air blow guns, lag-ps air blow guns and lag-t3 air blow guns. We gained wide acceptance for being the reliable entity involved in manufacturing and supplying an extensive range of high performing Air Blow Guns. High in demand for its threaded brass insert that assures zero damage even after repeated use these guns are specially designed to serve for rugged day in and day out usage. Developed with finest grade corrosion resistant stainless steel nozzle & internal parts the offered gun confirms to the OSHA STD 1-13.1 for safety. Further, our prestigious clients can avail this energy efficient gun from us at a market leading price. 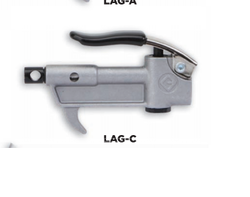 We are reckoned as prominent manufacturer and supplier of superior quality LAG-A Lever Air Blow Guns. Featuring unique & revolutionary venturi mechanism the offered guns use ambient air and are best suited for harshest work environments. We have used rugged die cast aluminum material to fabricate the body and have implemented sturdy operating level to control the amount of air output. Further, the gun is threaded with 1/4" (F) at inlet & 1/8" (F) at Outlet and can be ordered from us at the best price in the industry. We are highly experienced manufacturers and suppliers best known for the quality of developed LAG-C Air Blow Guns. It is the pro series gun trusted by many for creating much higher volume of usage output by combining compressed air and ambient air. 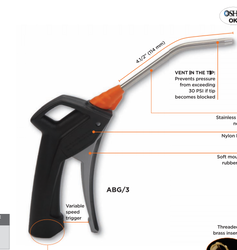 Featuring confirmation to the OSHA standards for safety and noise the offered blow gun is accessible with ¼” inlet BSP at a competitive price. 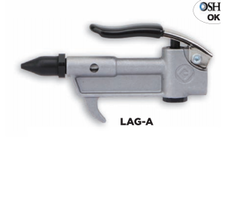 We are reckoned as prominent manufacturer and supplier of high performing LAG-PS Air Blow Guns. We have implemented innovative technology to bring forth a reliable air blow gun for rugged environments that effectively protects the operator from blown debris. Developed with compliance to OSHA standards the offered guns are featuring light in weight construction using premium grade aluminum alloy. Further, we are offering these easy to use guns with fatigue resistant operation lever and BSP threaded inlets which can be ordered from us at nominal price. We are reckoned as major entity actively engaged in manufacturing and supplying widely demanded LAG-T3 Air Blow Guns. This high performing lever air gun is designed to reduce compressed air pressure and widely trusted for its optimum performance equipped with the innovative venturi mechanism. 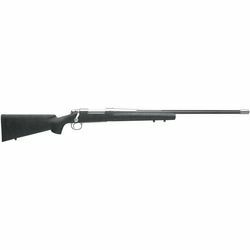 The offered gun features industry compliant manufacturing using non-corroding material and our prestigious clients can order it from us at the best price in the industry.